Smooth, complex and robust. An Irish whiskey as uncommon as its surroundings and colourful history, each drop presents an opportunity to uncover yet another subtle layer of its full bodied character. Crafted with enduring passion, each stage of our signature triple casked aging process adds to its warm golden hue, alluring aroma and remarkable taste. Malt, toasted grain and malt whiskeys are blended and matured in virgin oak casks, seasoned whiskey casks and Oloroso sherry casks to develop an inimitable complexity. Strong hints of vanilla on the nose follow with a smooth but full bodied mouthfeel that yields notes of Demerara sugar and ripe banana with bursts of rich caramel, vanilla and butterscotch. The whiskey finishes with lingering hints of dried fruit and delicate brown or baking spice. 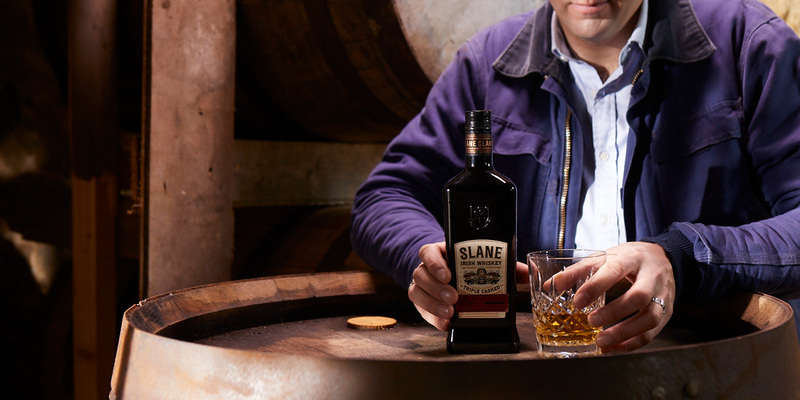 Masterfully blended and aged to perfection, Slane Irish Whiskey is a true reflection of our unique provenance and processes. This is an exceptional Irish whiskey for those living the stories that will be told for generations to come.